Hushcloth® Safe and Sound Melamine Foam (M) is a grey colored lightweight, high temperature resistant, open cell foam manufactured from melamine resin. It combines excellent thermal properties with superior sound absorption capabilities to create a versatile fiber-free, resilient compression product which can be applied in situations which may prohibit the use of urethane foams or fiberglass insulations. This fire retardant foam meets the flame spread, smoke density and fuel contribution requirements necessary to comply with Class 1 building code regulations. The high performance thermal and acoustical characteristics of this flexible, low density foam make it an ideal product for in-plant applications, transportation vehicles, and architecture. Water repellant treatment is available to make it totally water resistant. 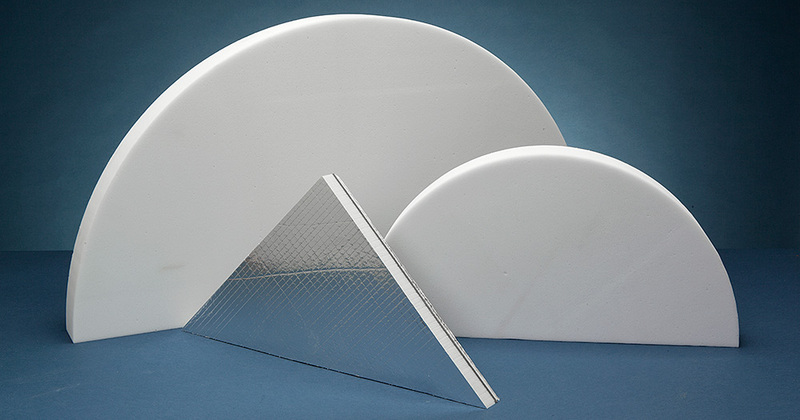 In addition to being the solution to aircraft and architectural noise problems, Hushcloth® Safe and Sound Melamine Foam is the material to use in OEM products requiring a combination of thermal and acoustical insulation capabilities. Optional facings can be applied for more durability and chemical resistance as well as pressure sensitive adhesive for ease of installation.